So the days are about to get longer... Unfortunately they will get colder too because of the slant of the earth in relation to the sun. Did you see Google's homepage this morning? I thought at first it may have been in honour of our knitting PM but it's a celebration of the solstice. Fun drawing. I've seen photos of Julia Gillard knitting booties but she's also auctioning off a scarf. Proceeds to charity and the winner can choose the colour. I imagine with all the dirt being flung around Parliament lately that knitting would be a welcome distraction. Gloves are flying off my fingers. 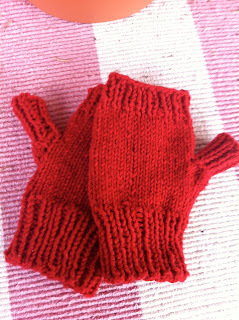 I've now made two pairs of fingerless gloves from the clever camel yarn The first is a bright red pair for master 7. He didn't want bedsocks as his cousins chose. He said he could wear any old pair. He wanted gloves and his choice was red. The last time he was here he drew around his hand so I knew his size. I've allowed some negative ease in these, but think they should be OK. Red is his current favourite colour but it's also the colour of his school uniform. They are made from the clever camel yarn from renae, aka suzyhausfrau in Canberra. I had really wanted to go to the Craft Exhibition last week but my hip was very sore and I didn't think I could walk too far. I've seen other bloggers write about their purchases from Renae's stall. Fortunately the hip has improved for the moment, but the exhibition is over for this year. Perhaps next year I'll get there. I've also done some gloves for my youngest son. It's bitterly cold and windy on his station in the morning, I've been there early and the wind blows off the water in WoyWoy Bay and also from the other side which is part of Brisbane Waters. No escaping its chilly fingers. I wondered about a pattern for him. I finally remembered my Patons Winter Warmers pattern book. My copy is old and I think it goes back many years before my copy. I found a pattern for mittens made out of Paton's Jet. The clever camel is worsted weight, so I went down in needles and cast on. I fairly well followed the pattern except for the graft at the top. I think they'll be OK. He is 6'5" tall with feet and hands to match the height. Even taking that into account, I think his hands are huge, an inheritance from his grandfather who was a plumber and didn't seem to need stilsons or other wrenches. He had enormous hands, unlike my dad who was fairly delicately boned, even though he was not short. I'm not particularly enthusiastic about the two tone effect, but I would not have had enough plain navy. I've made wrists longer than suggested to stop the draughts around the wrist bones. The thumb was interesting. Many fingerless glove have just a hole for the thumb. 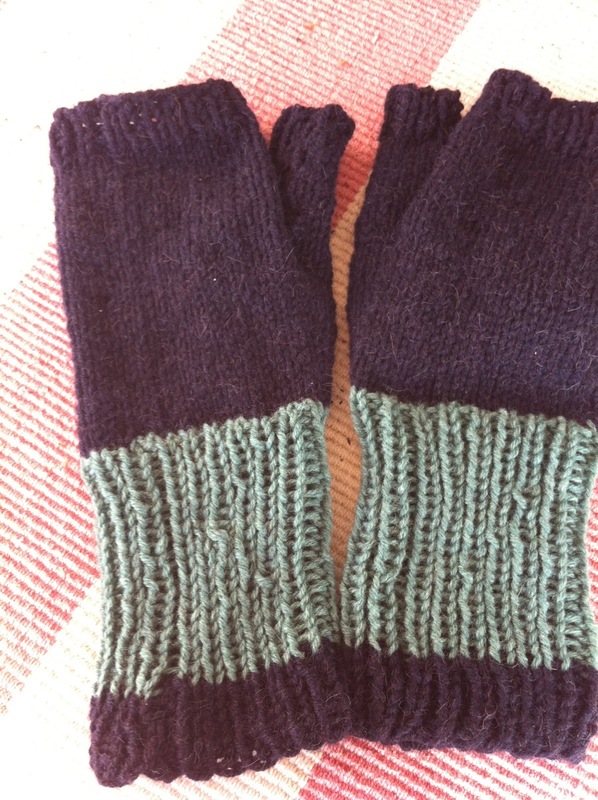 Some have a gusset with stitches picked up later and the thumb knitted up from there. The thumb in the Patons pattern had a gusset every fourth row instead of every second as many are. 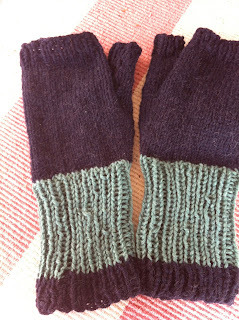 There was then a bit of short row shaping and the thumb was knit backwards and forwards a bit like a heel flap. This meant some sewing at the end, but using circulars on so few stitches is no picnic either. How the mighty are fallen, tell it not in Gath, publish it not in the streets of Ashkelon. I looked out on Wednesday morning over the car park below. (Now Friday) A police car was parked and a policeman was paying close attention to a BMW. He returned to his car, probably to use the computer. A few minutes later he came back to the BMW and took a small tool from his pocket. In a minute the number plates were off and in the police car and he drove off. Two days later the car is still there. It's in good view of the service station and nothing seems to have been stolen or stripped from it. But a BMW? A beamer? Reduced to sitting abandoned like a thirty year old Ford Capri or similar. I saw Julia Gillard is in the new Women's Weekly knitting and people made exasperatingly stupid comments about knitters. I am sitting here listening to 7-30 waiting to hear who the new PM is. I like the two tone effect of the mittens and the thumbs sound really interesting, the camel will be nice and warm. Such cute little mittens too. We had a motor bike abandoned in the same way at the dam where we walked. Eventually the owner came to retrieve it. Other walkers had rung the police in case someone had fallen off a cliff.